Any substance can become an 'allergen' and trigger reactions. Fooda and environmental substances are known to either cause or worsen symptoms. 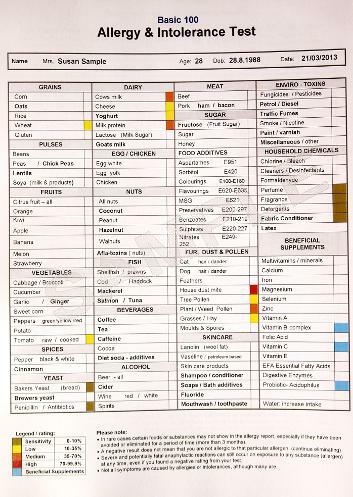 Establishing which food or substance is affecting you, or if you are affected at all, can turn out to be more than valuable information; giving you options to take control of your health & wellbeing and manage your allergic response(s). Respiratory tract: cough, catarrh, asthma, sinusitis, blocked or running nose, rhinitis, sneezing, hay fever, Glue ear, general breathing difficulty. Further associated symptoms include: Headaches & migraine, emotional disturbances--depression, lethargy, irritability, hyperactivity, tension, tiredness, fatigue & chronic fatigue(ME), weight gain or loss, water retention/oedema, general ill-health and not feeling well. 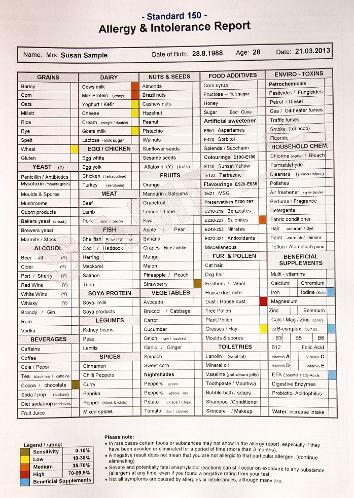 The over 8 different Allergy Tests include a choice for testing a variety of food items & substances: A choice of: 50, 75, 100, 125, 150, 250 or 400+ items and 300+ Digestion. The Allergy tests are established through a biofeedback method called Radiesthesia, analyzing a hair- sample, which contains the individual energetic 'imprint' or 'signature' of a person. Tha accuracy of the Allertgy & Intolerance Test is in our experience as high as 85%--99.9%. The result of the test is given as a printed report.